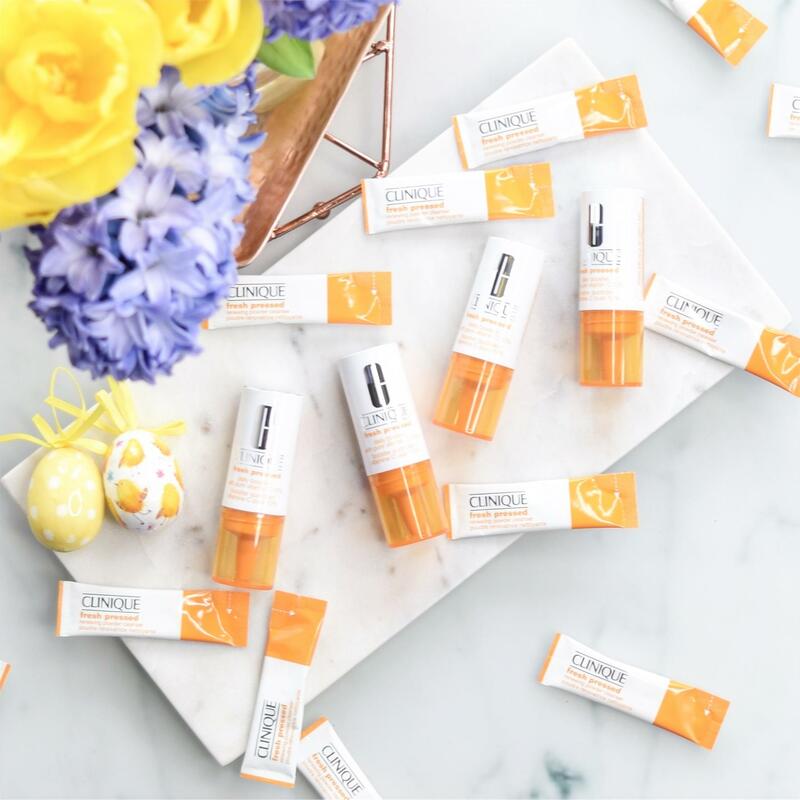 I am so excited to write about this range because Vitamin C is one of the main things dermatologists always seem to recommend you use. It helps give you bright and glowing skin but it’s always so expensive to buy in powder form which is what they recommend. Now Clinique has managed to harness the power of pure vitamin C in a powder and serum form with a formulation that is activated at the point of use for the fullest anti-ageing benefits. Vitamin C is one of the most powerful antioxidants for skin. It acts against external aggressors such as free radicals generated by UV rays and environmental pollution. It works to brighten and improve the texture of the skin, in turn giving a more youthful and glowing appearance. There are 2 products in the new Clinique Fresh Pressed 7 Day System. There is a cleanser and a booster. The cleanser comes in individual sachets and the booster in a squeeze applicator tube (which you activate yourself on day one and then lasts the 7 days). You receive 7 days’ worth of product as you will only need to use this for 7 days. You could use it before an event or if your skin is in need of a boost such as if you’ve been unwell or you are lacking a glow. Obviously you could just keep using it all of the time if you wanted to! The kit contains 7 packets of cleansing powder Clinique Fresh Pressed Cleansing Powder with Pure Vitamin C and one tube of Clinique Fresh Pressed Daily Booster with Pure Vitamin C.
Firstly, cleanse in the morning by mixing the powder from 1 sachet in your hand with a small amount of water, massage into the face for 1 minute once you’ve made a creamy but slightly gritty cleanser texture and then remove with a warm flannel. Once you have activated the booster you mix 2 drops of the booster into your moisturiser and you do this both morning and night for the 7 days. Activating the booster is really simple. Just remove the foil at the top, press the orange button twice then shake for 15 seconds. What Do I Think About the Fresh Pressed System? I tried the system out for the entire 7 days exactly as you are told to, to give a fair review. 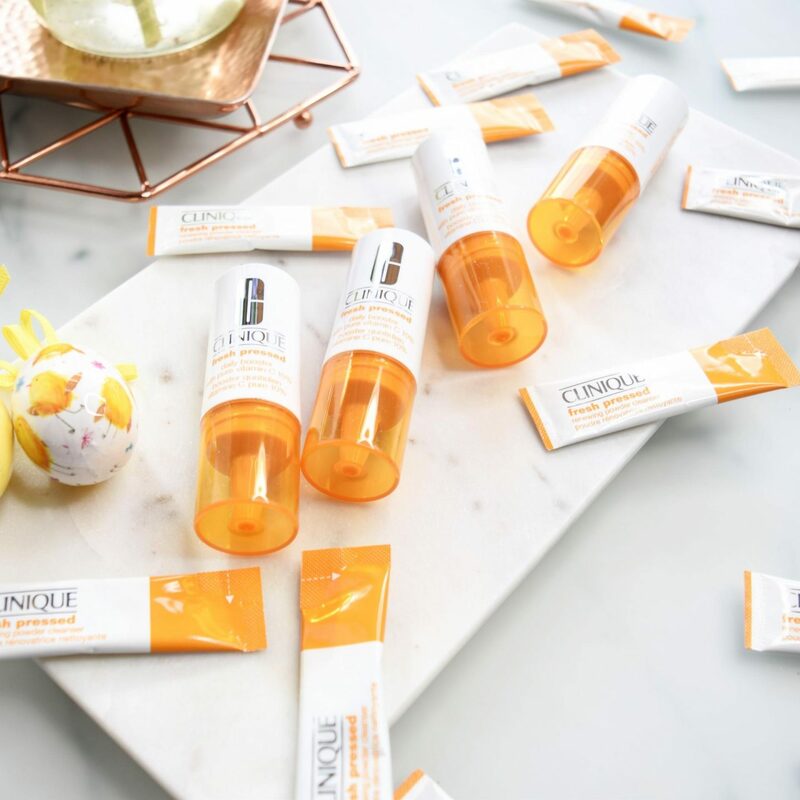 Firstly, I was very surprised and impressed with the massive leap Clinique have made in harnessing new technology and packaging methods to really up their game in the skincare world. I have never been the biggest fan of Clinique’s skincare (3-step system is not very good). But this has really changed my mind on their line. The cleansing sachets are incredibly handy, from being great to take travelling to reducing wastage and saving time in the mornings. The results have also been noticeable, my skin looks brighter and the texture does look better. The booster is epic. I hate unsanitary products, but this is literally foil fresh and you never touch the product with your hands the ultimate in cleanliness and product preservation and the packaging ensures everything stays fresh as it should for the 7 days. I would recommend this to anyone in their 30’s and up. I also think this would be good for pretty much all skin types (do a test patch if you have allergies in-store of course). If you’re looking to get a youthful glow back, reduce pigmentation marks and improve the texture of your skin. I am carrying on to use it for another week so if there are any more additional comments I will add them into this blog post as an edit. The Clinique Fresh Pressed 7 Day System with Pure Vitamin C is just £25 and launches on 10th March. You can also buy the cleanser and booster separately. Find it HERE at Boots. I don’t know if it’s still available but when I was in the airport clinique had partnered with Joe & The Juice and you got a free juice if you bought from Clinique as they gave you a voucher. So if you’re in World Duty-Free definitely ask if this is still going on! Product provided for review. Not sponsored.